EIA’s Annual Energy Outlook 2018 (AEO2018), released this morning, includes projections of U.S. energy markets through 2050 based on a Reference case and a number of sensitivity cases. The AEO2018 Reference case shows continued development of U.S. shale and tight oil and natural gas resources paired with modest energy consumption growth, leading to the transition of the United States from a net energy importer to a net energy exporter. The United States has been a net energy importer since 1953, but the AEO2018 Reference case projects the United States will become a net energy exporter by 2022. This transition occurs even earlier in some AEO2018 sensitivity cases that incorporate assumptions supporting larger growth in oil and natural gas production or that have higher oil prices. In the High Oil and Gas Resource and Technology case, favorable geology and technological developments increase oil and natural gas supply, leading to higher energy exports. In the High Oil Price case, before 2040, economic conditions are more favorable for oil producers, supporting higher levels of exports and lower domestic consumption than in the Reference case. Exports decline after 2040 in this sensitivity case as a result of the lack of substantial improvements in technology. 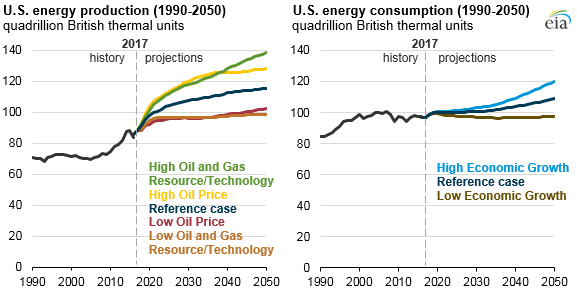 The AEO2018 presents updated projections for U.S. energy markets through 2050 based on the Reference case and six additional sensitivity cases: Low and High Economic Growth, Low and High Oil Price, and Low and High Oil and Gas Resource and Technology. The AEO2018 Reference case incorporates only existing laws and policies and is not intended to be a prediction of the future. The sensitivity cases incorporate different key assumptions that reflect market, technology, resource, and policy uncertainties that affect energy markets. Increases in energy efficiency temper growth in energy demand throughout the Reference case projection. Energy consumption grows about 0.4% per year on average in the Reference case from 2017 to 2050, which is less than the rate of expected population growth (0.6% per year). Annual real gross domestic product (GDP) growth is expected to average 2.0% through 2050 in the Reference case. Almost all new electricity generation capacity is fueled by natural gas and renewables after 2022 in the Reference case. Natural gas prices are projected to remain lower than $5 per million British thermal units until the very end of the projection period. The costs associated with adding new renewable electricity generation capacity are expected to continue declining, especially for solar photovoltaic systems. Production of liquids and natural gas continues to grow for decades. In the Reference case, production of shale gas resources is projected to increase through 2050. U.S. liquids production (mostly crude oil and petroleum products) begins to decline toward the end of the projection period as less productive areas are developed. AEO2018 is a full edition of the AEO, incorporating in-depth updates on changes in legislation and regulations and including a large set of sensitivity cases that will be explored further in forthcoming Today in Energy articles. Sign up for email notifications of the Issues in Focus articles, which will be released in the coming months. EIA is hosting a live webcast of the AEO release event at 10:00 a.m. today.